CHICAGO -- It was a rough 15 minutes, but Chael Sonnen did enough to get the fight he's coveted for 17 months. The middleweight title contender locked up a shot against the UFC's 185-pound champ Anderson Silva with a surprisingly tough win over Michael Bisping. In a fight, that appeared to be a toss-up for some, Sonnen took a unanimous decision, 30-27, 29-28 and 29-28, in the co-main event of the UFC on Fox 2 card at the United Center. Sonnen's win sets up an intriguing scenario. UFC president Dana White guaranteed the winner of tonight's tilt the next shot at Silva. The champ has been sidelined since August with shoulder and back issues and the promotion is pointing towards a summer return. But Silva recently hinted that he may be out beyond the summer. Sonnen (27-11-1, 6-4 UFC) believes Silva is ducking him and has done everything he can to call out the champ. Tonight, he made the wise decision of not poking Silva. Instead, he delivered a hilarious postfight speech talking about his own greatness. "As I've told everyone before, when you're the best fighter in the world, they don't call you champion, they call you Chael Sonnen," said Sonnen. Sonnen was good, not great tonight, but much of that had to do with the opponent. Bisping (22-4, 10-0 UFC) rubs plenty of fans and media members the wrong way and, as a result, he's a bit underrated. The common thought was that the Brit would get eaten alive by Sonnen's Olympic-level wrestling, but that didn't happen in the first two rounds. 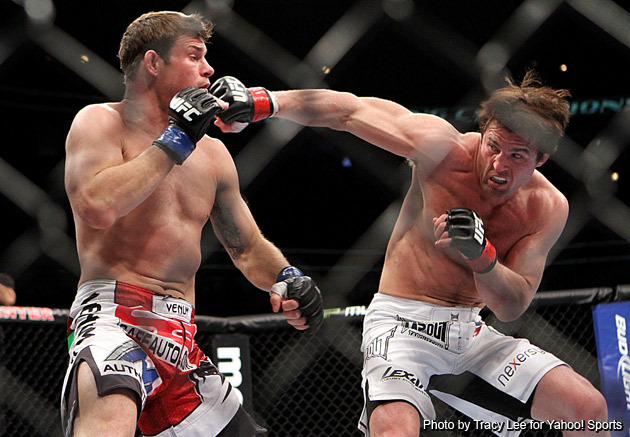 Sonnen scored two takedowns in the first, but Bisping got to his feet in less than 25 seconds on both occasions. He also stuffed two more takedown attempts. In the second, Sonnen scored a takedown with 2:58 left. Bisping was up a minute later and took minimal damage. The Brit was effective in the striking game, landing a few good combinations, but nothing appeared to rock the hard-charging American. Sonnen admitted during the postfight press conference that he was shaky on one occasion after a big shot from Bisping. UFC color voice Joe Rogan was convinced Bisping had won the first two rounds. That wasn't the case on the judges' scorecard, but two of them did have things 19-19. Sonnen did what he needed to in the final round. He scored a big takedown and really dominated the position for over three minutes. Sonnen scored that takedown just 12 seconds into the round. Bisping defended well for the next minute but got a little impatient as he was just about to rise to his feet. Bisping gave up his back standing and Sonnen squashed him. Then he did a brilliant job of getting both hooks in and rolling to dominant position on the ground. He worked to lock on a rear-naked, but it didn't happen. Bisping was protecting from the choke, lost his focus and allowed Sonnen to roll the position into the mount with 2:31 left. With 1:31 left, Bisping hip escaped to full guard. Bisping eventually got to his feet with less than 20 seconds left and scored a takedown of his own. He even landed a few big elbows, but it was too little, too late. Bisping thought he won the first, but didn't flip out. "That was a great fight. My hat goes off to Chael, he won the fight tonight. But, I really felt that I did enough in rounds one and two to secure the victory. He won the third, but I really felt that I was up on the judges' scorecards. They saw it differently and it is what it is," said Bisping. Now the question is when will the fight everyone wants - Sonnen vs. Silva II - actually go down? Sonnen turned up the heat in recent weeks, plainly stating that he'll never get to face Silva because the champ won't accept the fight. "I'm not going to fight Anderson either way. They can say whatever they want. Anderson is never going to do that fight," Sonnen told "The MMA Insiders" show on Las Vegas' ESPN1100/98.9 FM. "I hope he's healthy and has a good life, but I'm not buying into this mythical world that Anderson is going to some day sign a contract to fight me." Silva beat Sonnen at UFC 117 via fifth-round submission, but that was after getting dominated for 23 minutes. He's had to hear about it ever since. This is a chance to shut Sonnen's mouth and likely do it in front of a record-sized crowd in Brazil. Why would he pass on the opportunity?